Beef, soy sauce, water, brown sugar, liquid smoke, sugar, chipotle peppers, paprika, garlic, onion, cayenne pepper, dry mustard. The first thing I taste from the surface of these pieces is a thick sweetness, with touches of smoke. The spices come in quick, giving off a light spicy heat with a light blend of cayenne and chile peppers. The chewing flavor brings in a well-noticed garlic and onion flavor and a more defined taste of chile peppers and cayenne. The saucy base created by the soy sauce adds a nice savory body, while the natural meat flavors become lightly noticeable along with a faint tinge of that mustard. For being marketed as "Pitmasters BBQ #21", it definitely stands up as a barbecue flavored beef jerky. It has that heavy sweetness of a Kansas City style barbecue, but also the bold, spicy seasoning of a Memphis style dry rub. There's also the light but noticeable smokiness and the combination of soy sauce, garlic, and onion to give you a very savory base flavor. 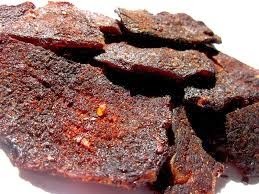 Otherwise, the flavor that seems to define this jerky the most is a combination of strong sweetness, the garlic and onion blend, a smoky profile from the liquid smoke, paprika, and chipotle peppers, and the spicy dusting of cayenne. The natural meat flavors come in light, more noticeable towards the latter part of chewing, and then finally a faint pungent note most likely from the dry mustard. All together, the ingredients combine into an explosion of flavors that does a great job of resembling slices of marinated, slow-cooked, barbecued beef. There's a moderate level of heat to this, ranking as "medium" on my personal heat scale (level 3 out of 5). These are slices of whole meat, sliced into medium sized slabs, and sliced medium thick. 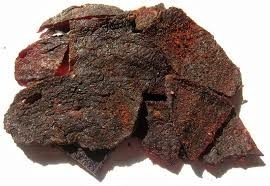 This is a dry jerky with a mostly dry surface feel, though slightly sticky. Biting off pieces seems easy to do, and chewing is overall easy, though slightly labored. The chewing texture starts out with some initial chewing resistance, but easily chews down. It takes on a meaty feel immediately, and by the time its chewed down to a soft mass, it feels somewhat steak-like, as the heavier sweetness gums this up some. I see a couple of small streaks of fat on one piece, and on another I found a small streak of gristle. I encountered no stringiness or other unchewable tissues. In terms of clean eating, it's mostly clean, aside from some bits of seasoning sticking to my fingers. Pap's sells this new Pitmasters Barbecue #21 from its website at a price of $6.99 per 3.25oz package. Shipping is free as of this writing. That works out to a price of $2.15 per ounce. For general jerky snacking purposes, at the $2.15 per ounce price, it's a good value. Compared to other brands of jerky sold in stores, this offers much more flavor, a better flavor, and a good meat consistency with a little better chewing texture. 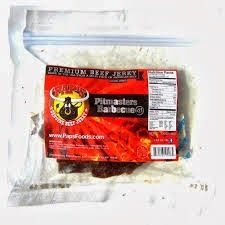 As a barbecue flavored beef jerky, at the same $2.15 per ounce price, it's also a good value. Compared to other barbecue flavored jerky brands, this barbecue flavor goes above and beyond in terms of thick sweet, bold spiciness, noticeable smokiness, and a savory base flavor. This Pitmasters Barbecue #21 from Pap's Beef Jerky really gave me the "wow factor" I look for when assigning my highest rating. It addresses all the different taste buds on the palate with a thick Kansas City style sweet, a bold Memphis-style seasoning rub, that spicy Louisiana-style heat, and a great base marinade combo of soy sauce, garlic, and onion. I was still able to pick up a light natural meat flavor in the latter part of chewing, and there was even a touch of pungent taste which may be attributed to the dry mustard. Overall, it's a jerky wakes you up and makes you think about what you're tasting. 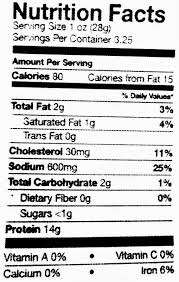 The meat consistency and chewing texture is quite trademark of Pap's Beef Jerky, pretty much all meat with little fat and nothing unchewable. It's mostly easy to chew, moderately tender, with a steak-like chewing texture, though this Pitmasters Barbecue #21, because of the heavier sweetness, tended to feel a little gummy.